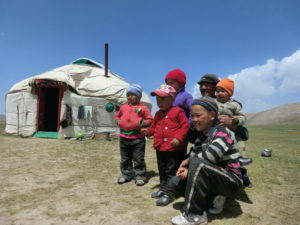 After two great days in Kyrgyzstan, it’s hard to believe there could be a third beautiful day! 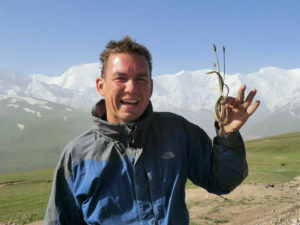 Celebrating my birthday in the Pamir Mountains, close to the border with Tajikistan! 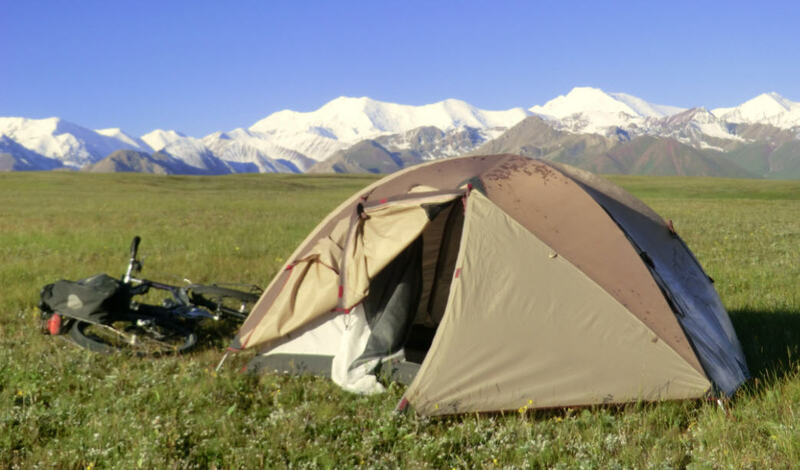 No mobile phones or internet access, just 25 km cycling up mountain, machine guns, BBQ with a sheep and a marmot, vodka, sparkling wine, camping on grass lands and fire works! What a day to get older?!?! The Pamir Highway (a way high in the mountains) actually starts in Sary Tas, We took a left turn strait towards the mountains. 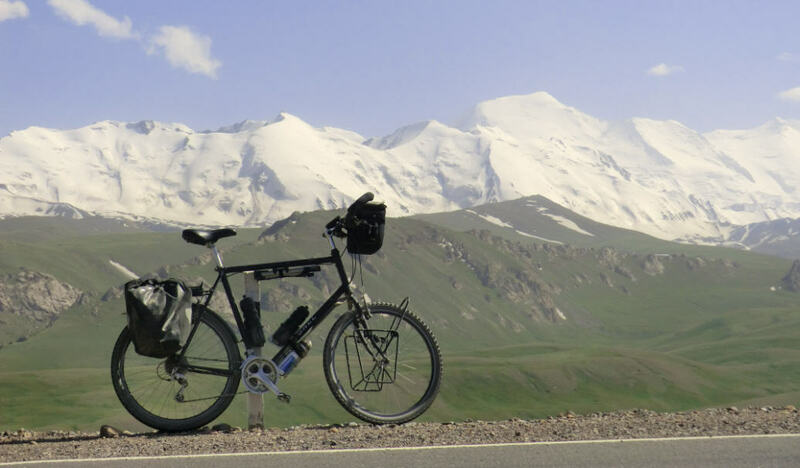 The road, paved but full of bumps and holes, went uphill towards the border and into Tajikistan. It was half clouded and not particularly cold or warm. There was no traffic and since it was only 23 km, John, Candice, Emma and I were not in a hurry. After 1.5 km we stopped at a guest house for a cup of tea. Besides tea they served us another breakfast, so there was even more reason to take it easy. 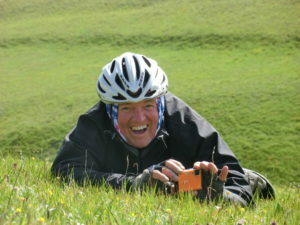 Once we were on the road again, John noticed he had left his water bottle at the table, so he cycled 2 km back and the three of us sat down and enjoyed the view of the mountains. We continued only to stop now and then to take a picture, drink some water or have a chat. What a great start of the day! Camp was (for a change) approximately 2 km away from the road, on grass land with an incredible beautiful mountain view. The head of border security was facilitating our border crossing and, since he is in the military, he offered us to shoot with a Kalashnikov AK47 and a 7 mm full automated machine gun. Now, that was something I didn’t expect when I got out of bed this morning. 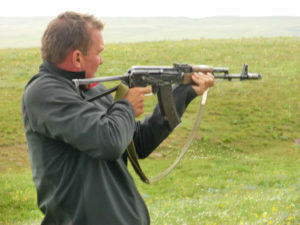 The AK47 made a lot of noise and it was difficult to aim at the water bottle, some 300 meters away. The full automated machine gun was more fun! Lying on the ground I was able to hit the water bottle in a way that it went 5 meter in the air! It started to rain and the security officers went on a marmot hunt and the 6 of us went back to camp. Half an hour later they were also in camp with a marmot for the BBQ! In camp I learned that, as a sign of hospitality, the officers also offered us a sheep for dinner and an hour later they were actually cutting this sheep into smaller pieces. Impressive to see how efficient they were able to do this. Interesting to see how the intestines of a sheep look like. I also learned that the meat tastes better when you sprinkle it with vodka ;-). I bought three bottles of local vodka, someone else another one, and I noticed that before 21:00 hours all four bottles were empty. Sorry, no pictures from the party, my camera was somewhere in my tent… Just after sun set, I lighted the fireworks I bought thousands of kilometers ago. It was a great ending of my birthday and together with the vodka I slept great! Thanks everyone for the birthday wishes! In the mountains I didn’t have any mobile or internet access, so it’s just now that I’m able to read all your messages! Thanks!